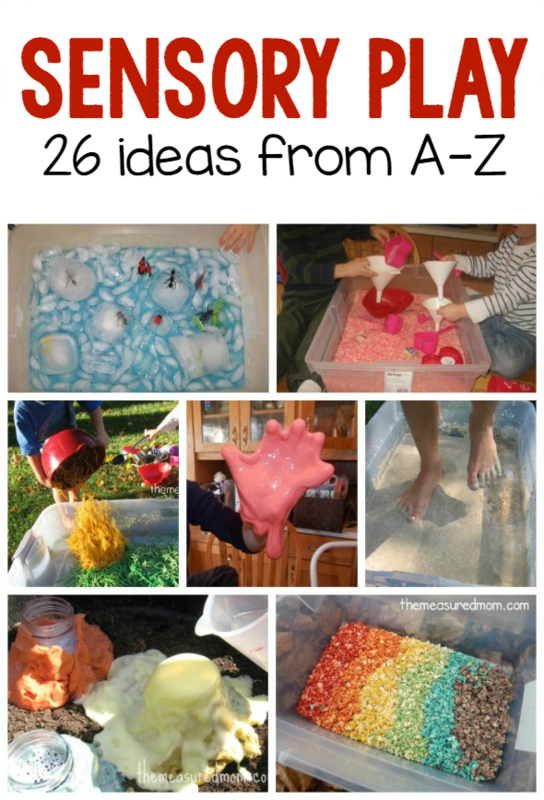 Sensory play ideas from A to Z! 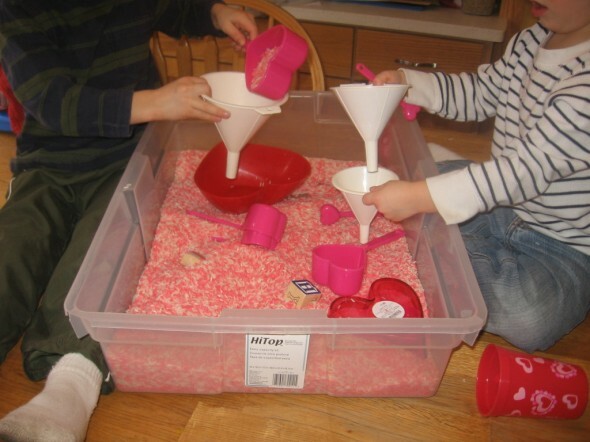 We’ve got 26 fun sensory play ideas! 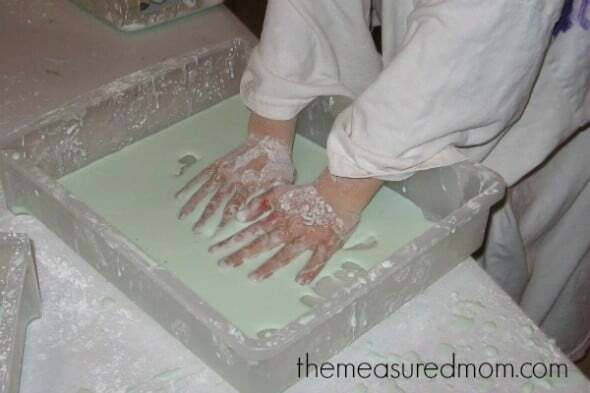 So… do you do a lot of sensory play at your house? You know, where you let your kids get messy? On purpose? If you’re like me, you’re already cleaning up a lot of messes all day long. This may not be something you want to add to your list. 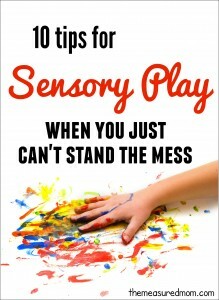 But sensory play is good for kids on so many levels. And you don’t have to pull it out every day. Once a week is a great goal… for you and me. 😉 If that’s a little daunting, try other every Saturday. It gives them multiple ways to learn about their world. It provides opportunities to improve motor skills. It helps kids’ emotional development. It allows children to be creative. That’s why we included sensory play ideas in our letter of the week activities. And here are they are – all in one place! I printed apple number cards and pictures of objects that begin with the short a sound. Then we buried them in oats and dug for the matches. 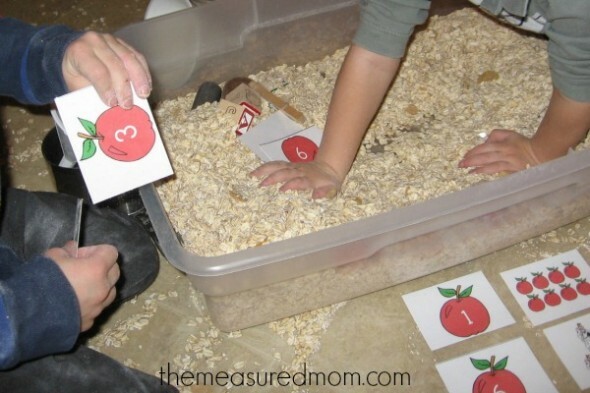 Get your free printables in our sensory play for letter A post. 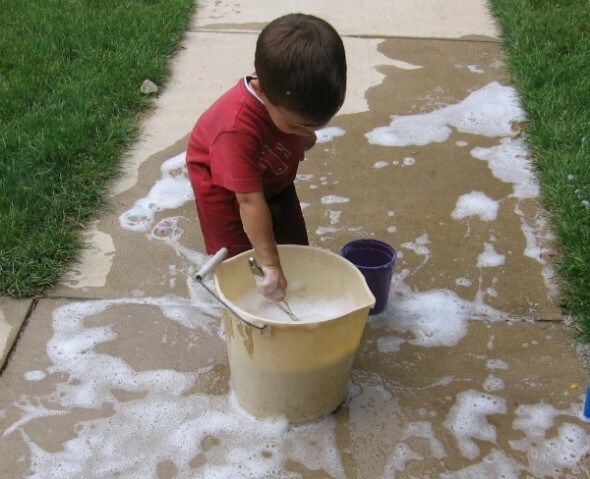 Get some dish soap, a bucket, hose, and a whisk… and your toddler or preschooler can make his own bubbles. This kept my son busy for 45 minutes! For six other fun ways to play with bubbles, check out our letter B post. We love cloud dough, which you can make with two simple ingredients. Read about how we buried coins in our cloud dough to add some math to the mix. We made a super soft dough, buried our dinosaurs in it,and dug for them. Get our play recipe here. We hunted for objects that started with the letter e. Then we buried them in rice and beans and dug for them. 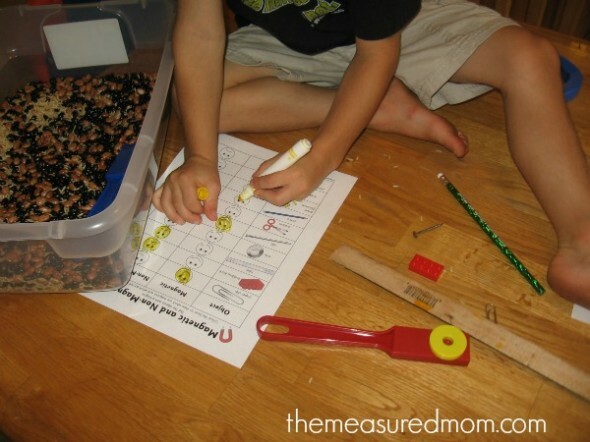 Check out how we did some beginning phonics practice with this activity as well. We put our dry rice and beans in a box and gathered our farm toys. My boys created a farm. Easy peasy! Read more about our farm in a box here. My four-year-old loved planting dry beans and labeling the rows with craft sticks. 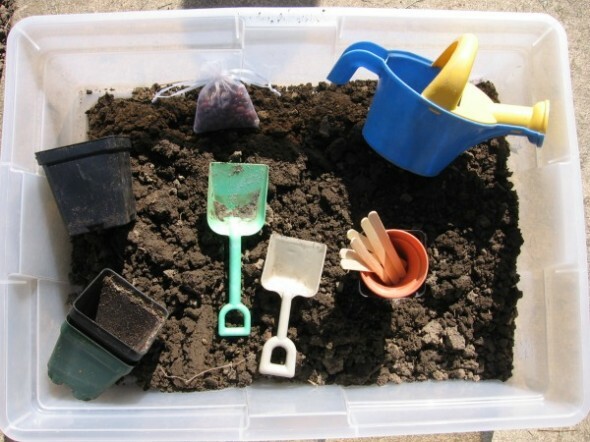 Learn how this garden in a box became a great literacy activity! I colored some rice pink and bought some heart shaped bowls and scoopers. The boys had fun pouring the rice through funnels. Learn how we dyed our rice. 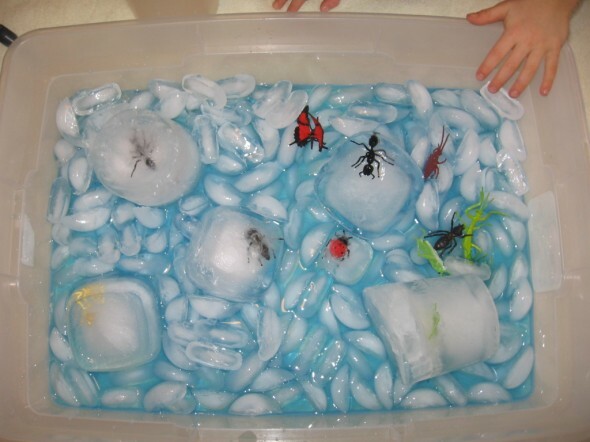 I froze toy insects in water, and the kids enjoyed the challenge of getting them out. We did this at the kitchen table during a chilly spring, but if you can do this in the summer it’s a great outdoor activity. See the fun we had in our icy insects post. I’ve not been too successful at getting my older kids to enjoy messy sensory play like this… but a certain member of the family enjoyed it! 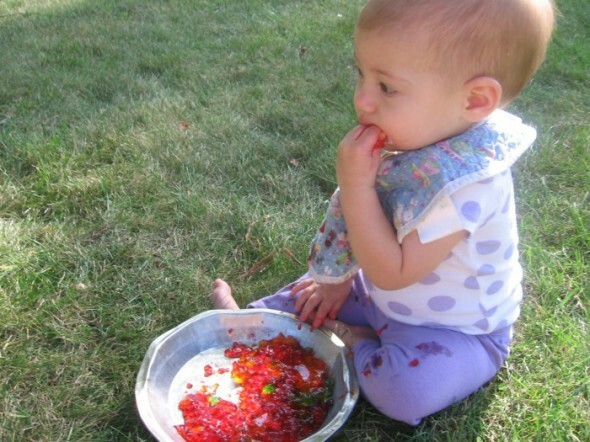 Her first and last taste of Jello… at least for a while. 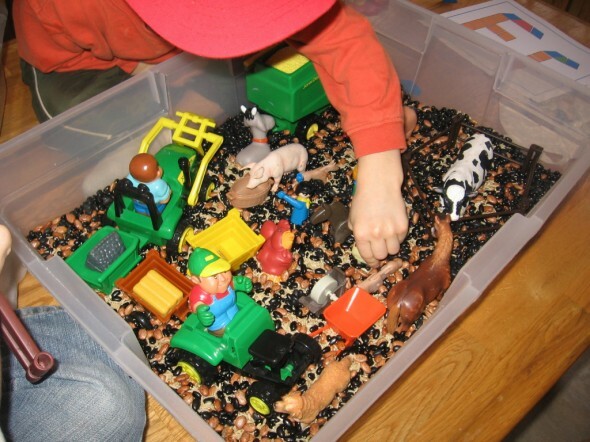 This is by far the most popular sensory play we’ve done! The next time you’re about to throw away old spices or expired pantry items, save them. 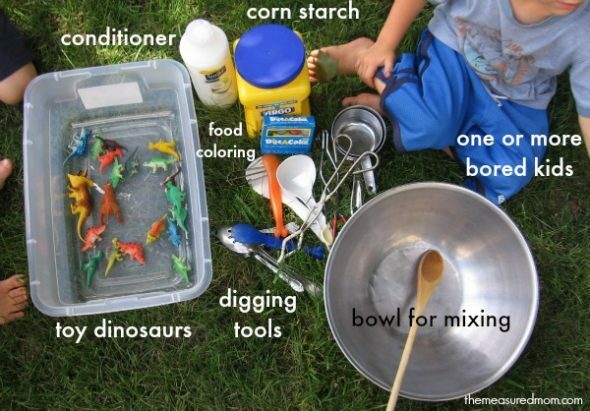 Put some bowls, spoons, and other items together for a fun outdoor kitchen. And don’t forget our two favorite ingredients! You’ll find them in our sensory post for letter k.
I dyed some alphabet pasta and mixed it together for a very pretty sensory bin. Then I wrote letters on glass gems and buried them in the mixture. I created a simple alphabet printable for my son to match the letters he found. Get your free printable in our post about sensory play for letter l.
What a fun one! You’ll need some magnets and some objects that are both magnetic and nonmagnetic. We used the printable you see in the photo. Learn more about our kids’ magnet set and the free printable in this post about magnet sensory play. After I cooked and colored spaghetti noodles, the kids had a lot of fun with them out in the backyard. 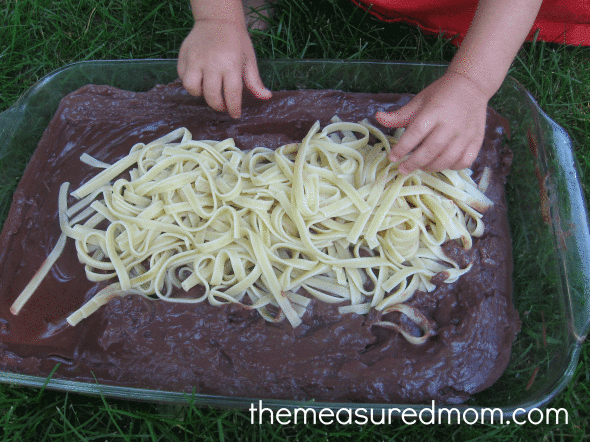 See how we colored our noodles in our post about noodle sensory play. 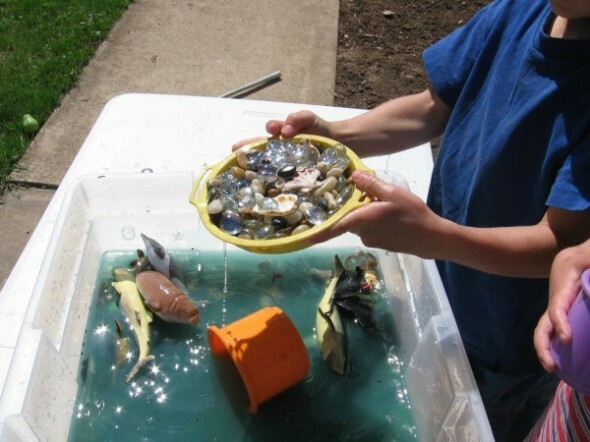 I put some gems, shells, sand, and toy ocean animals in a bin of water outside. Our ocean sensory play kept my two-year-old busy for a long time! Homemade play dough is so easy to make, and it lasts for months! 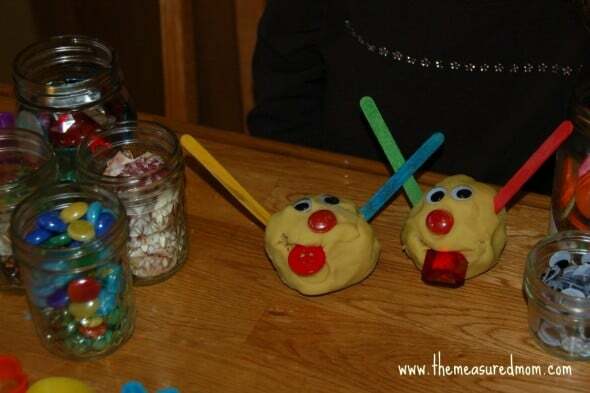 Plus, when you pair it with fun craft items, your kids will stay busy for a looong time. We needed just three ingredients to make this homemade quicksand! Find out how we did it. It was easy to make these rainbow colored oats, and my toddler can’t get enough of them. 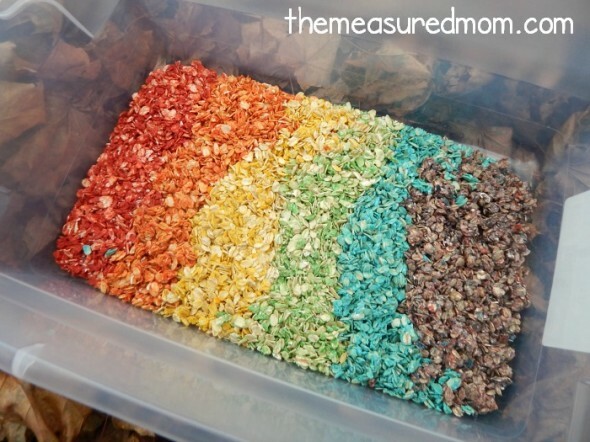 Learn more in our post about rainbow sensory play. My kindergartner had so much fun with our pink slime! We learned our lesson, though… next time the vinyl mat comes out before we begin. And sleeves are rolled up! 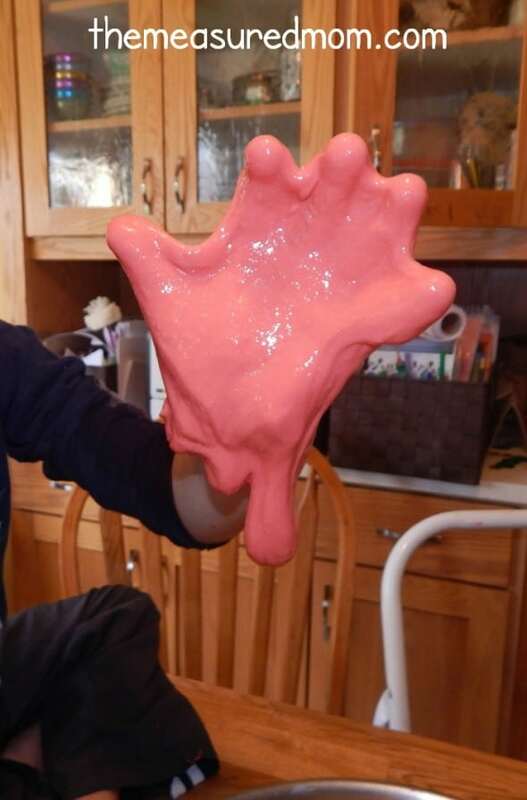 Learn how to make your own simple slime in this post. In the midst of a looong winter, I did the unthinkable and brought a big bin of sand inside the house. 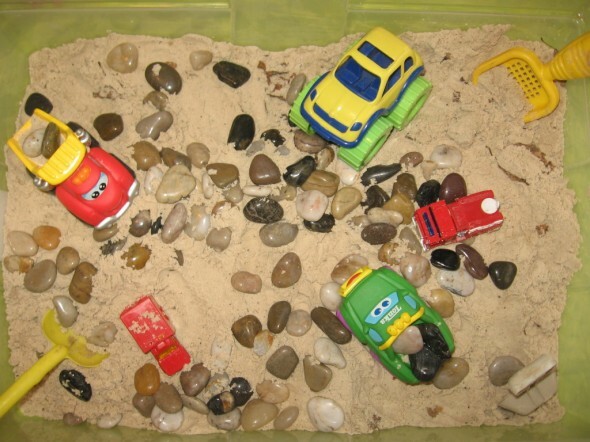 We pulled out our trucks and had some fun with our indoor sandbox. 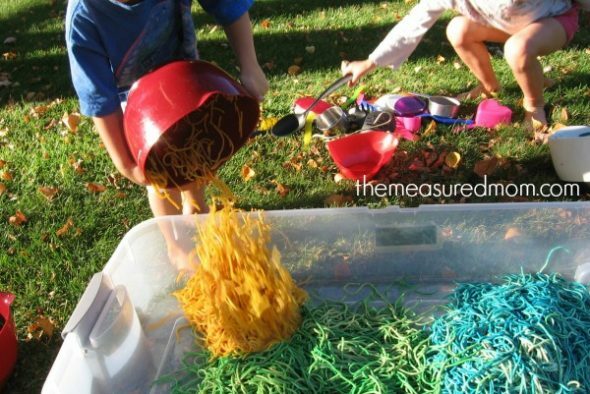 If your weather is nice, this is the perfect low-prep sensory activity for the outdoors. Though my kids have done this many times, I have no pictures because the weather got cold before I’d taken any! Just find a spot in the garden or flower bed. 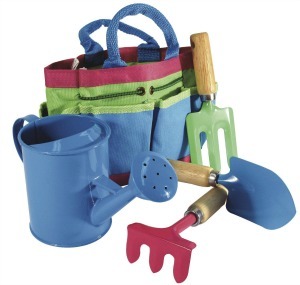 Provide your child with some kid-friendly digging tools and watch him dig underground. 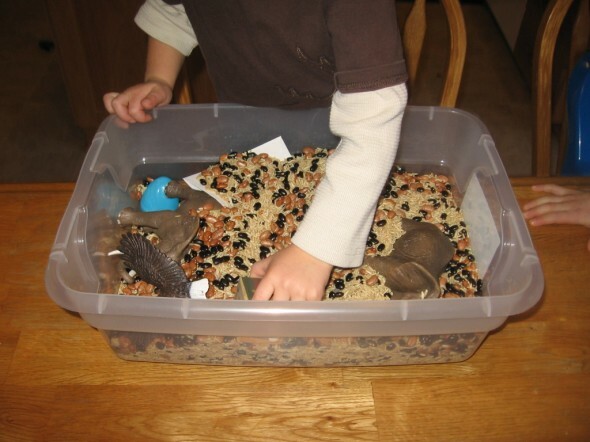 The simplest sensory play ever. 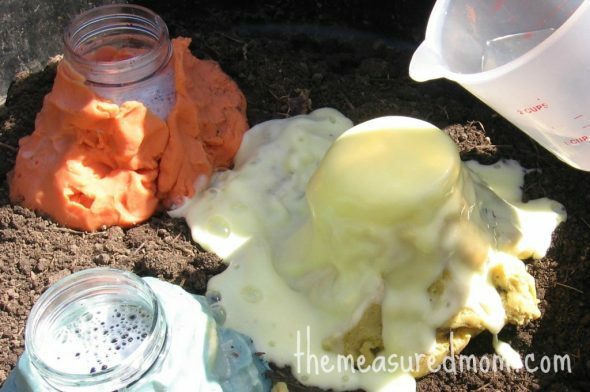 We had a lot of fun making these play dough volcanoes in our backyard. The kids often ask to make them again! See how we made our backyard volcanoes in this post. IF you have access to a copier that can make copies on overhead transparencies, this is actually quite simple to set up. 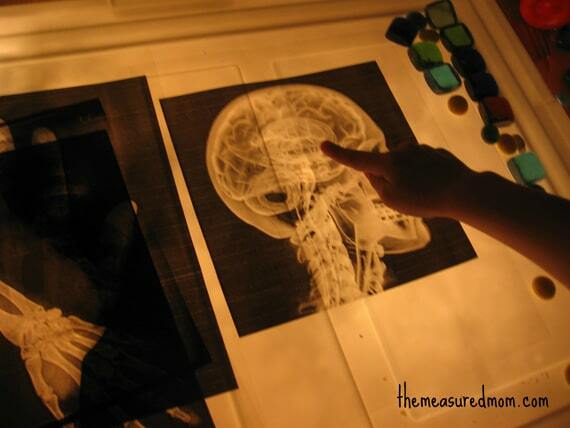 Read more about our X-ray light box! This is a very simple sensory material that requires just three ingredients (and two of them are water and food coloring!). The consistency is really fun to work with, and this has the potential to keep your kids busy a long time. We did this one in the dead of winter, but take it outside if you can! This was a great rainy day activity. We just got our filler of dry rice and beans, and the boys created a zoo with their toy animals. The only clean up was some sweeping. 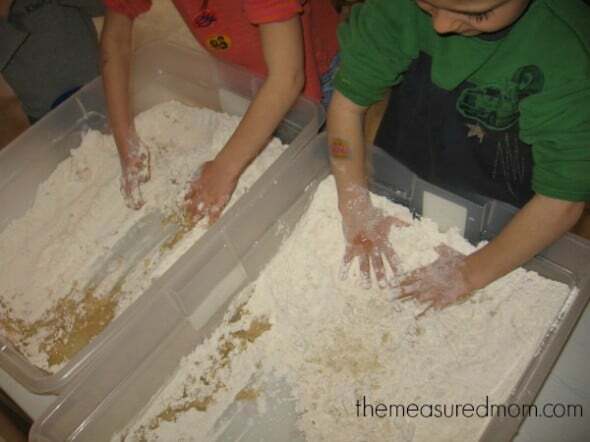 See the fun we had and find some other ideas for zoo sensory play here. So, what do you think? 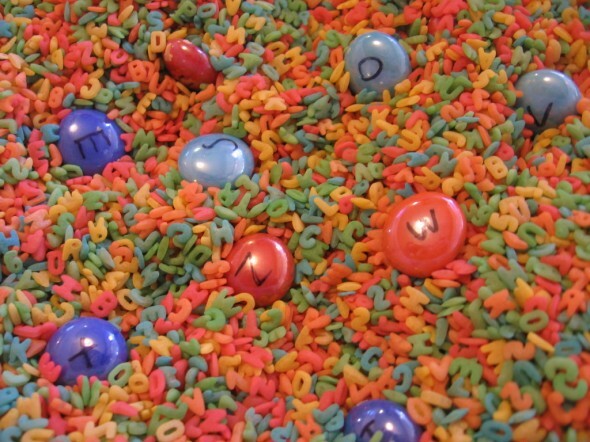 Will you try some of these sensory play ideas as you learn about the alphabet? I also recommend this post! 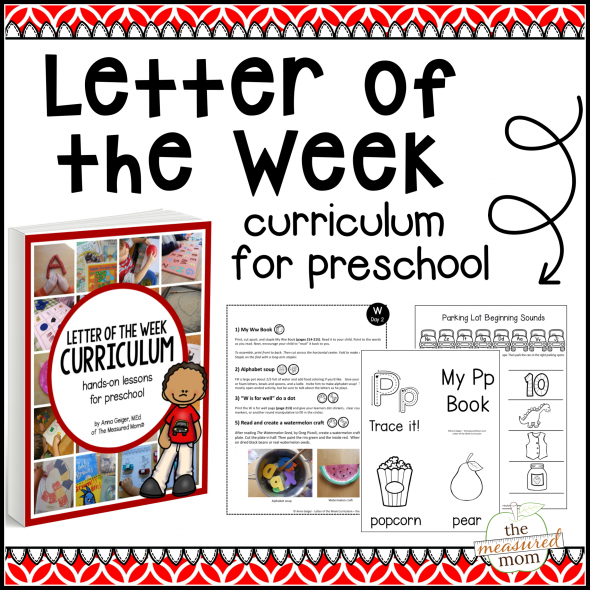 Get links to the best alphabet activities – organized into a daily curriculum! I’ve missed your e-mails, but see you’ve been very busy! 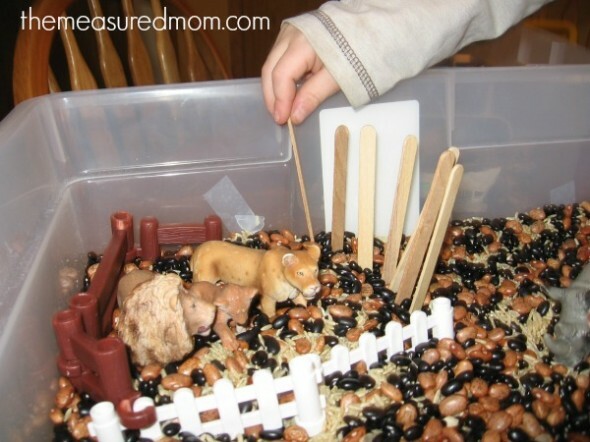 Thanks so much for these sensory bin ideas. They’re just what my Grands (2 & 4) need! I’m so glad to hear it, Linda – have fun with them! Some great ideas here, thank you. Our school has a no-food policy (as in we are not allowed to use any food like rice, pasta or dough unless we are going to eat it). What would you suggest as alternatives? 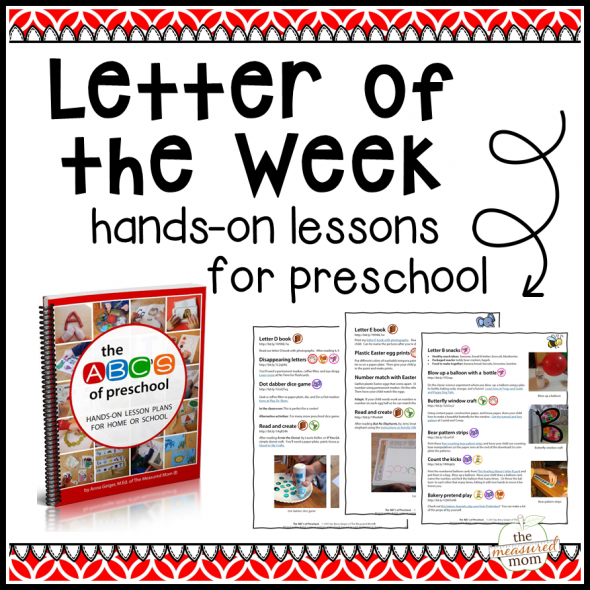 This post from Little Bins for Little Hands has some great ideas! I’m so glad this works for you, Jawad!